Everyday we create our lives by what we do everyday. Powerfully owning your morning, especially on a Monday, creates a foundation for the rest of the day and the rest of the week that has you powerfully in control of the life you want to build. I consider my mornings to be sacred. I wake up some days even before the sun does. I have a routine that consists of meditation, movement and fuel that feed me everything I need to be my best self. There are some days that don't go according to plan. We all have them! The alarm didn't go off and that morning rush begins, which makes everything just slightly off. If we are what we repeatedly do, then greatness needs to start from the moment we awake so we have all the energy we can must working for us. To do that , we need to create a morning routine and powerfully own your day from that first moment. There are 4 different areas to look at when you are creating your Powerful morning routine. Which area do you need to begin to cultivate? Journal 10 things you are grateful for. Even if right away your mind sees the world as half empty, start with big things like a roof over your head and food in your belly. Meditation. Grounding yourself with quiet time is a powerful way to get present and make yourself prepared to face the day. Try this meditation by clicking here. Account-abilla-buddy! Having someone to bounce ideas off of, to clear what's sitting on your shoulder and inspire you can be a great way to start a work day. You only get one body and when it's in pain, not working properly or not feeling confident, it takes energy away from the life you are creating. Use your morning time to get it ready to take on your dreams with these simple tips. Exercise in the morning. If you get your workout in first thing in the morning, it will be a sense of accomplishment for you as you go through your day. You'll feel like a boss because you would have gotten more done before most people even wake up in the morning. Fuel properly. Even if you aren't a big breakfast person, you still need to fuel yourself like a boss to get the most out of you. That means even something small like a piece of fruit or a smoothie can set you up to show up at your fullest energy level till your first official meal. Fresh air. Most people spend a majority of their day inside. Spend your morning going for a walk or at least stepping outside. You'll never regret the energy you get from outside un-recylced, unconditioned air. There are many levels of relationships: Significant other, family, friends, community, world, universe and source. Our lives are lived in the relationships we have with others. But the foundation of all relationships is the love we have for ourselves. How do you cultivate this relationship? Self care morning routine. We all take that time in the morning to brush our teeth, but what if you dedicated your entire self care routine to the love you have for yourself. The act of washing your hair and putting lotion on your face can be an expression of self love, instead of just something you do! Acts of kindness. As you begin your morning, go through your commute and interact with others, start noticing how you show up in the world. What compassion can you show to those around you? Money is simply energy! We put way too much meaning in what is in our bank accounts. Instead of ignoring our money, make it part of your routine to create the life you know you want. Look at your balance in the morning. Most people ignore it and are then surprised when its somewhere else. Knowing gives you power so spend a moment every morning seeing where you are so you can make powerful money decisions during the course of the day. Create powerful boundaries. Budgets can be powerful things so you can create structures around what you are building in your life. See where you are inside of the budgets you create and only carry the cash you are allowed to spend. Remember that the life you want is on the other side of your day to day actions. You deserve to have a life you are excited about. Build it today with a powerful morning! Powerful mornings are just one aspect of an entrepreneur's fulfilling life. 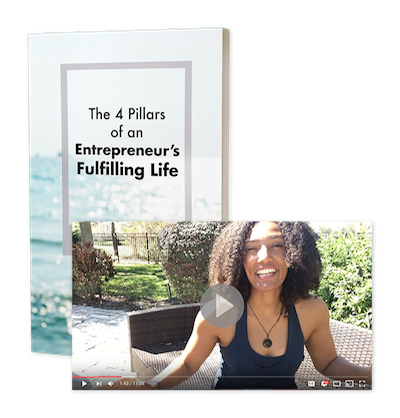 That's why I created The 4 Pillars of an Entrepreneur's Fulfilling Life, a PDF + video you can use to learn how you can create new habits, new mindset, new relationships and new structures so you can be a true boss in the face of anything.